Although a car accident left him paralyzed from the waist down decades ago, Lampasas High School graduate David Wear (left) has not let the injury stop his athletic dreams. In fact, Wear says he has accomplished more after the injury than he probably would have if the accident never had taken place. 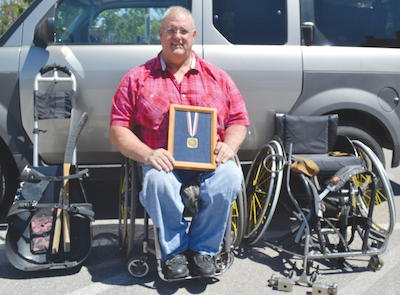 The Lampasas grad has competed in Vienna Austria (1987, Bronze Medalist) and competed at the Paralympic Games 1988 and other international competitions for handicapped athletes. He has bench-pressed nearly three times his body weight. And, he has ridden from Houston to Austin in two days on a handcycle – a three-wheeled vehicle powered by his arms. 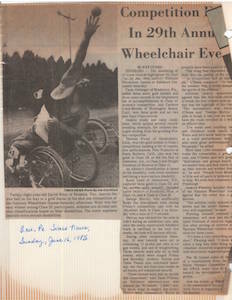 Wear has competed in all kinds of adaptive sports, including shot put (see news clipping below, from 1985), discus, javelin, wheelchair basketball, hockey, table tennis, archery, and even swimming. Among all sports, he estimates he has won about 150 medals in his career. At age 57, Wear and his Texas Stars sled hockey team placed second out of about 10 teams in their division at a competition in Boston. Most recently, they won the National Championship in Dev. C Sled Hockey in Buffalo New York in 2015. Wear has his Ham Radio License and is a Pilot as well.